It was not that long ago, that some folks were wringing their hands about drought in California, claiming that normal rains were a thing of the past. 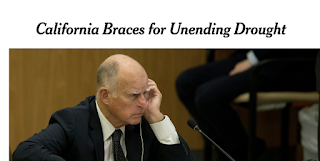 The NY Times and other outlets warned of "permanent" and "unending" drought fueled by global warming. 2013-2015 were dry years, but 2017 was extremely wet, 2018 was near normal, and 2019 is turning out to be a real soaker. The official U.S. Drought Monitor, which often lags behind facts on the ground, officially removed drought status from California this winter. This winter, the water situation is extraordinarily good for virtually all of California, with their very large reservoir system storing much more water than normal. Let's examine the situation. Here is the difference from normal of the accumulated precipitation over the past six months. 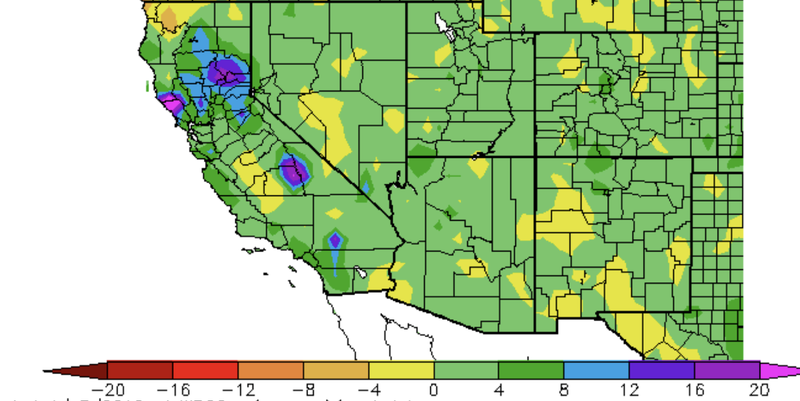 Nearly the entire southwest U.S. was above normal, with parts of California being 8-20 inches above normal...that is a lot in California. Water storage is everything in California, and unlike Washington State, they have multi-year storage capacity. Why? Because historically California experiences more variation between wet and dry years than the more reliably wet Pacific Northwest. 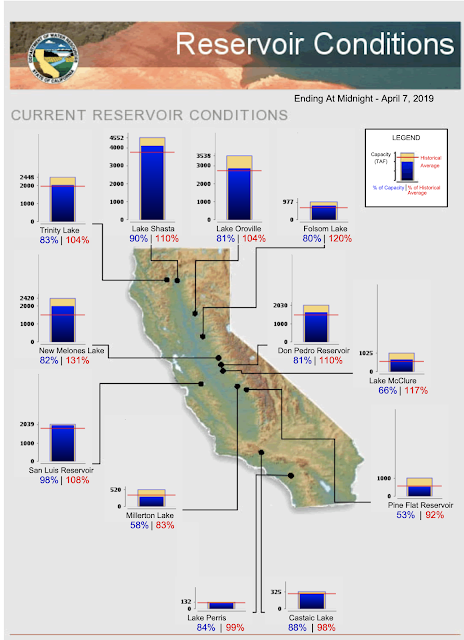 The current reservoir conditions are excellent, with all of the major reservoirs being well above normal. Some are even near capacity (e.g., San Luis and Lake Shasta). 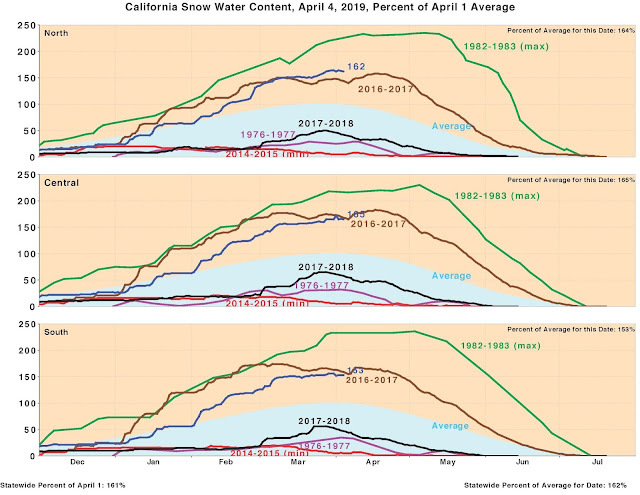 The other major water storage system is the snowpack....and CA has a HUGE snowpack this year, averaging about 165% of normal (see below). Streamflow? No worries. 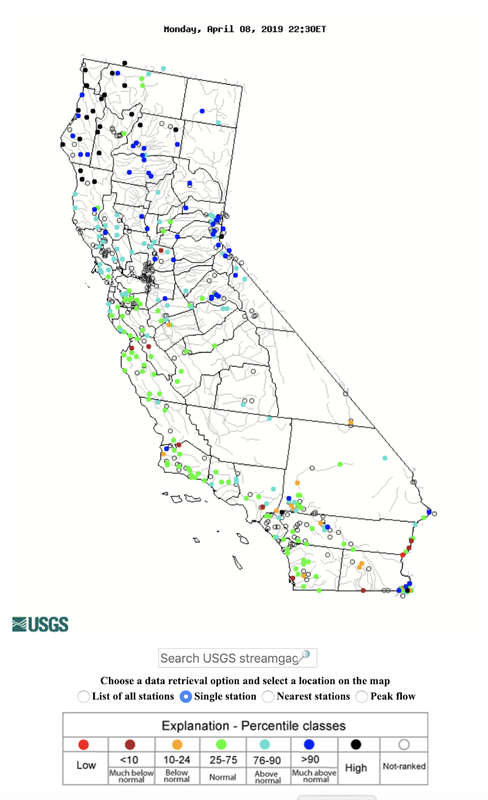 Streams are running much above normal or high over the northern portion of the state ( blue and black colors) and near normal over most of the southern half. Surface soil moisture is above normal for most of the state (not shown). The bottom line of all this is that California has had an extraordinarily moist winter (and a very wet March) and there will be plenty of water for the urban centers and agriculture this year. 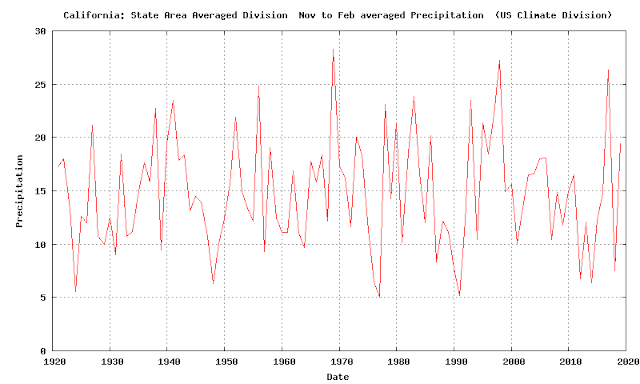 To put things in perspective, below is the California precipitation for November-February 1920-2019 using the NOAA/NWS climate division dataset. March 2010 was not ready yet. The first thing you notice is that there is virtually no long-term trend. Nada. There are drier years (like 2013-2015) and wetter periods. 2019 was above normal but not exceptional. 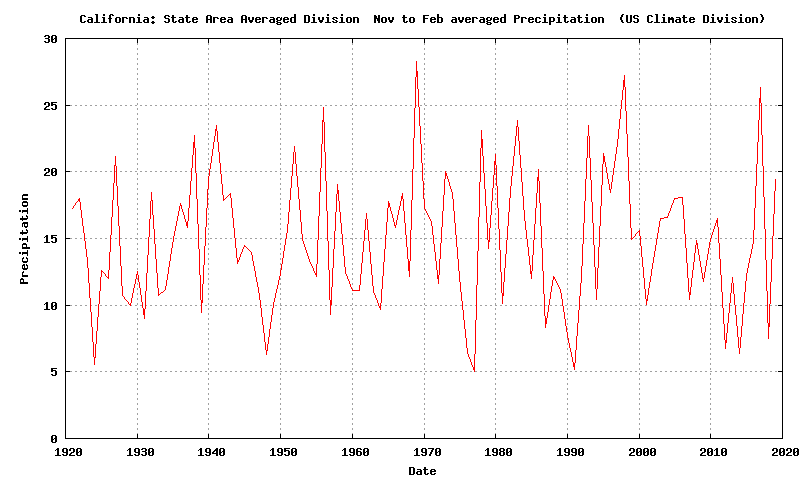 If March was available, the current winter would have been one of the wetter ones. This lack of trend in CA winter precipitation is consistent with most climate models simulations I have seen, which suggest no decline in precipitation for central and northern CA under global warming (see a sample from the UW high-resolution climate simulation project I am involved with). 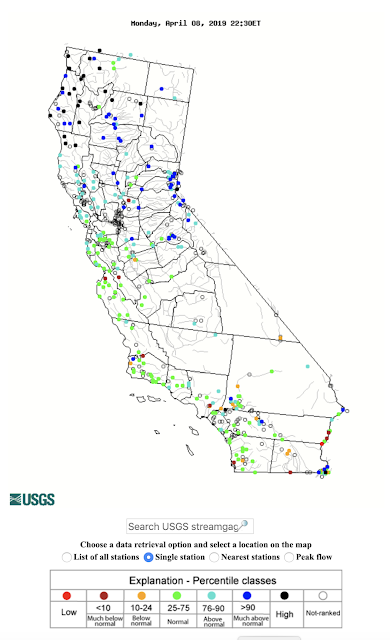 In fact, precipitation over the northern portion of CA might even increase. But that does not mean that California is entirely out of the woods. Temperatures WILL rise under global warming and that will increase demand for water, particularly for agriculture. And California is currently "mining" its ground water at an unsustainable pace. So adaptations will have to take place, like growing less water intensive crops (e.g., almonds and cotton), using better irrigation technologies, and increasing the use of desalination plants on the coast. California will not be facing an "existential" threat under global warming, but will have to take reasonable steps to adapt to a warming climate. The reason I have come to this blog for years and will continue to do so. Thank you Cliff. Oroville is above its historical average AND you say there's been a huge snowfall in California -- looks like they will get to test the new spillway out this spring...? How about population stabilization rather than desalinization? Nothing wrong with living ecologically. Thank you for bringing facts to this discussion. Thank you for making sense. Yes, we do need to adapt to a warmer climate rather than pretend we can change it. 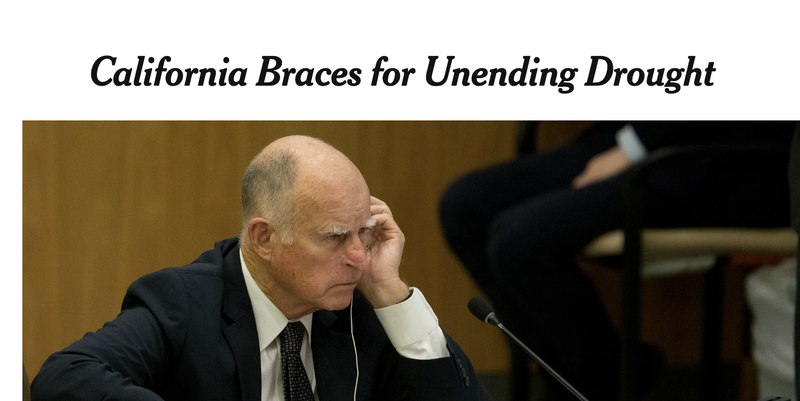 "I don't understand this comment "California will not be facing an "existential" threat under global warming, but will have to take reasonable steps to adapt to a warming climate." Are you saying that the only thing CA needs to do in response to warming is 'reasonable steps to adapt'? How does that not apply to the rest of the globe as not being under an "existential threat" an only requiring 'reasonable steps to adapt to a warming climate'. Perhaps I'm missing some context or something. Water, of course, is only one aspect or context for many areas regarding climate. I'm sure you know that. The New York Times... A former news paper. Ooo I like that ECMWF ensemble map. Can amateurs reach that? I'd like to see that one more often. Longview area has reached 2" the past five days thanks to a few solid t-showers; too far north for the big action as forecast, but some slow rollers caught us good! @sunsnow12 ... yep ... the same reasons I come to this blog amid the irresponsible mainstream alarmist / doomsday hype. I'm tired of the Chicken Little screaming "The Sky is Falling!" when it is not. Will we encounter challenges, yep. Can we better take care of our planet, sure. But natural variability is the main cause of warming, not humans. At least, not yet. The corollary to "We must act because it's a calamity!" Is "We needn't act of it turns out it wasn't a calamity after all." The reality is somewhere in between, I imagine. Jason E Box, William T Colgan, Torben Røjle Christensen, Niels Martin Schmidt, Magnus Lund, Frans-Jan W Parmentier, Ross Brown, Uma S Bhatt, Eugénie S Euskirchen, Vladimir E Romanovsky, John E Walsh, James E Overland, Muyin Wang11, Robert W Corell, Walter N Meier, Bert Wouters, Sebastian Mernild, Johanna Mård, Janet Pawlak and Morten Skovgård Olsen. Published 8 April 2019 • © 2019 © 2018 The Author(s). ABSTRACT: Key observational indicators of climate change in the Arctic, most spanning a 47 year period (1971–2017) demonstrate fundamental changes among nine key elements of the Arctic system. We find that, coherent with increasing air temperature, there is an intensification of the hydrological cycle, evident from increases in humidity, precipitation, river discharge, glacier equilibrium line altitude and land ice wastage. Downward trends continue in sea ice thickness (and extent) and spring snow cover extent and duration, while near-surface permafrost continues to warm. Several of the climate indicators exhibit a significant statistical correlation with air temperature or precipitation, reinforcing the notion that increasing air temperatures and precipitation are drivers of major changes in various components of the Arctic system. To progress beyond a presentation of the Arctic physical climate changes, we find a correspondence between air temperature and biophysical indicators such as tundra biomass and identify numerous biophysical disruptions with cascading effects throughout the trophic levels. These include: increased delivery of organic matter and nutrients to Arctic near‐coastal zones; condensed flowering and pollination plant species periods; timing mismatch between plant flowering and pollinators; increased plant vulnerability to insect disturbance; increased shrub biomass; increased ignition of wildfires; increased growing season CO 2 uptake, with counterbalancing increases in shoulder season and winter CO 2 emissions; increased carbon cycling, regulated by local hydrology and permafrost thaw; conversion between terrestrial and aquatic ecosystems; and shifting animal distribution and demographics. The Arctic biophysical system is now clearly trending away from its 20th Century state and into an unprecedented state, with implications not only within but beyond the Arctic. The indicator time series of this study are freely downloadable at AMAP.no. A nice blog as usual Dr. Mass. Enjoy reading your 'detective work'. Here's a paleoclimate perspective on the drought. While articles calling it a future with unending drought are certainly alarmist, a few years of well above average precipitation will only act as a buffer for so long. I think today's statement is much more reflective of what he actually believes about global warming, which is more like a pleasant winter vacation to the south. It also explains why global warming skeptics are so attracted to Dr. Mass. 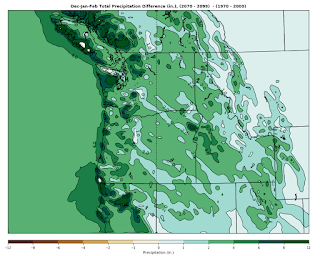 This seems consistent with the recent UCLA study predicting ", a 25% to 100% increase in extreme dry-to-wet precipitation events is projected, despite only modest changes in mean precipitation. " Good for CA, but too much mining of ground water is just wrong! Leave some for future generations. Hope all is well, Cliff. The Pew Charitable Trusts--founded by oil & gas heirs of the Sun Oil Company--just released its Spring 2019 magazine entitled "Trend"..Analysis of the Facts, Numbers and Trends Shaping the World." This issue is devoted entirely to water, "The Future of Water." "The shifting patterns of water availability, along with failing groundwater levels, will further limit access to drinking water and water for irrigation, presenting new socio-economic and political implications. Over 2 billion people already lack access to safe drinking water at home, and by 2025 over half of the world's population will reside in water-stressed areas. These numbers will increase significantly if climate change and population growth follow or exceed predicted trajectories." California already imports water to support its large population which is concentrated in the drier parts of the state. It also produces much of our produce that we import. As water scarcity intensifies due to human overpopulation, depleted aquifers and ever growing agricultural demands, people will migrate to water, and in fact, this has already started. If this plays out as predicted, where within 6 years another 2 billion people or so will live in depleted water zones, there will be chaos and pressure on areas that still have water. The Pew Charitable Trust is encouraging governments to plan accordingly. Well stated Cliff.. Save the world from itself! Adaptation is key to a species evolution and survival. Dispite the fact that humanity has altered the planets climate with the release of greenhouse gasses for millennia to come. Our greatest threat is ourselves.!! Alarmists panic and unwise denial both can get humanity on the list of species lost during the current great extinction event.